First cut a 6" x 9 1/2" piece of white card stock and fold it in half for the base, a 4 1/2" x 5 3/4" piece of burgundy for the middle layer and a 4 1/4" x 5 1/2" piece of patterned paper for the front layer. 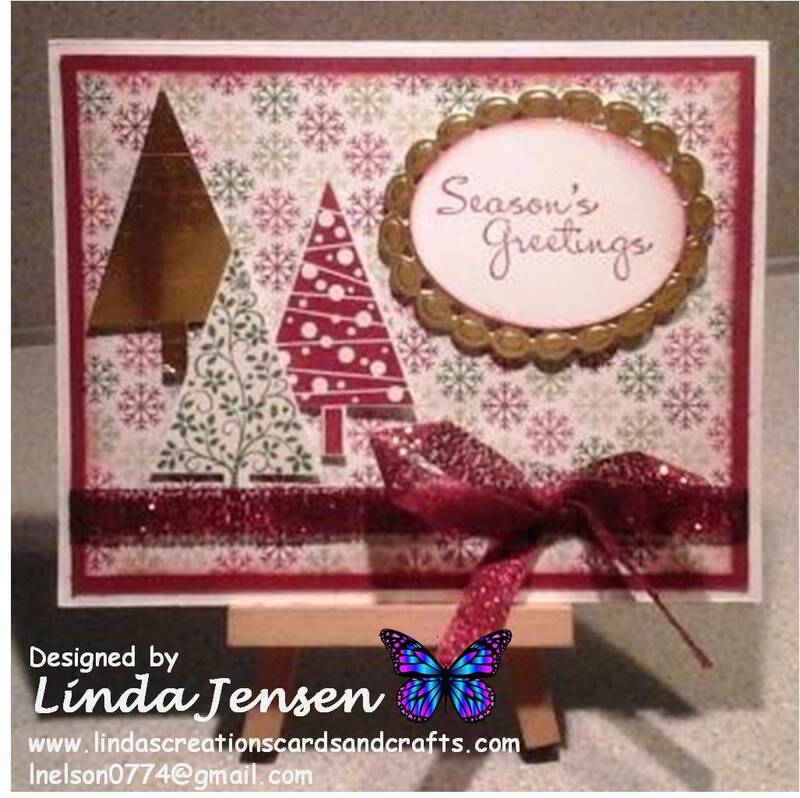 Next stamp the trees on white card stock with Stampin' Up! Garden Green and Cherry Cobbler inks then punch them out with the Stampin' Up! Tree Punch along with one out of metallic gold paper, and attach them to the front layer with mini pop dots. Then cut out both of the sentiment's ovals with Spellbinder's Classic Ovals and Beaded Ovals dies and emboss the beaded oval. Next stamp the sentiment using a stamp from a Stampin' Up! 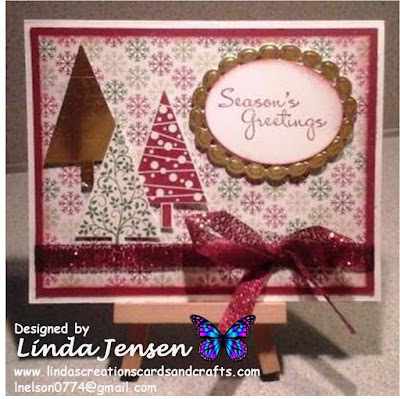 More Merry Messages set in and sponge the edges with Stampin' Up! Cherry Cobbler ink, attach the sentiment to the beaded oval then the beaded oval to the front layer. Then sponge the front layer's edges, attach the front layer to the middle layer, attach the ribbon around both layers then to the base and enjoy!